Through the use of quick-change inserts, standard dies, single-station fixtures, and know-how gained from over fifty years of precision stamping experience, we can provide both the high quality you require along with a reduction of costs by as much as 85% when compared to conventional methods. Precision-built tooling is manufactured to make sure your parts and assemblies meet or exceed your most critical performance requirements and hold tight tolerances. We make reordering easy, quick, and cost-effective. For the lifetime of your part or assembly, we will provide tooling & die insert storage and maintenance services at no additional charge. Service Stampings charges a nominal, NRE (Non-Recurring Engineering) fee for the initial engineering, tooling, and proprietary die inserts required for producing your part. That same part can be reordered in the future as many times as you need without incurring any additional charges. 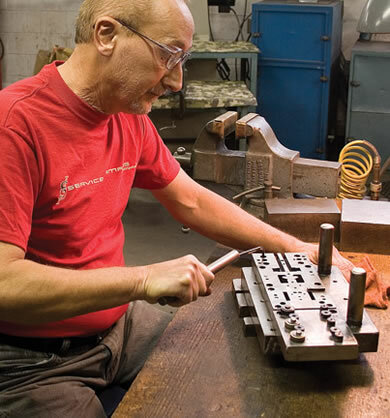 Learn more about industries served by Service Stampings, Inc.
Email us to learn why OEMS trust our precision stamping expertise, OR Click here to find a sales representative in your area.